Shades Starts The Year With A Bang - Make That A Shot! This is one of the most interesting photography research projects I've done in a very long time. I purchased the cabinet card mainly for the intriguing information contained on the reverse of the photograph. Little did I know that this would lead me to a story of murder, an attempted lynching, courtroom antics, lies, a hanging, and misappropriated body parts. Not to mention this cabinet card and the part it may have played. 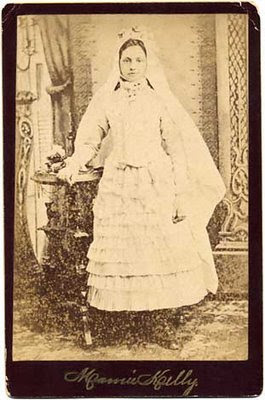 The young girl in this typical first communion photograph is Mary (Mamie) Elizabeth Kelly. She was fourteen years old and a student in Mrs. Armstrong's eighth grade class at John Swett Grammar School on McAllister street near Gough in San Francisco, California. She was a fourteen year old in 1886, a child. Very much more naive and immature than the fourteen year olds of today. On 10 November at approximately 3pm Mamie was dismissed from school and started walking home with Eveline Kelly (no relation) one of her classmates. Mamie was wearing a red dress with a checked apron and a wide brimmed straw hat with a dash of red ribbon wound around it. Her brown hair was in the typical school girl fashion of the day, pushed back from her face with a circular comb falling into a braid over her shoulder. She carried a wicker-work lunch basket and her school books. The two young girls arrived at the corner of Polk and McAllister streets at about 3.15pm where Mamie was approached by 19 year old Alex Goldenson, who called to Mamie. Mamie told Eve she would see what he wanted. Mamie walked down Ash with Goldenson, Eve waited for her at the corner. On the northeast corner of Polk street and Ash Avenue, directly in front of the grocery store on Polk, Mamie and Goldenson stopped to talk. After a few moments Goldenson pulled a gun from his pocket, yelled "Take that and go," and shot Mamie just above the right eye at very close range. Mamie dropped to the ground quivering and died instantly from the bullet that pierced her brain. Upon hearing the gunshot Eve turned, saw Mamie fall to the ground, panicked and ran home. John Stanton also heard the shot. He was a wagon driver for a Contra Costa Laundry and had been driving down Polk. He saw the gun, heard the shot, and saw Goldenson run down Ash street toward Larkin. Stanton leaped from the wagon and started in pursuit, chasing Goldenson into the new City Hall grounds. During the chase Goldenson threw the gun into a hedge outside the police station. Running inside the police station to the desk sergeant, Police Officer John C. Ayers, Goldenson confessed saying, "I killed her. I killed my girl. They're going to lynch me." Goldenson turned around to Stanton who was directly on his heels and asked, "Didn't I?" Stanton answered, "Yes." Stanton then asked him why he had shot her. Goldenson replied, "Because I couldn't get rid of her." Goldenson was taken into custody, the gun was found. A large crowd, including many of her school mates had gathered around the body of Mamie. The wide brimmed straw hat with the dash of red ribbon, her wicker lunch basket and her school books lay scattered around her. Her face was black with powder burns. 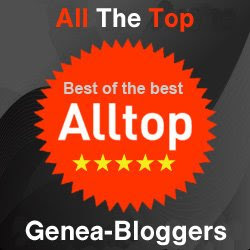 A stream of blood poured out from the bullet wound immediately over her right eye and formed a muddy course down the sloping sidewalk to the gutter. The police arrived and Mamie's body was loaded into the wagon and taken to the Morgue. A large crowd followed the Morgue wagon and remained outside the building the entire time Mamie's body was kept there. Mamie was a rather pretty young girl about 5' 3" tall with brown hair and dainty features. 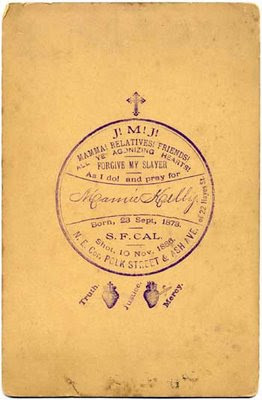 Seven years before her father John Kelly died and her mother, Kate, went to work as a domestic in the household of J. Baum at 1111 Van Ness Avenue. Mamie lived with her Grandmother, Dora Sweeney, her mother's sister, Maggie Sweeney, her Uncle Anthony Sweeney, and a grand uncle at 22 Hayes Street. She was the darling of the household and the entire neighborhood for that matter. Mamie's mother visited two or three times a week for an hour or so and had seen Mamie the Sunday before her murder. Mamie's teacher and all the neighbors and relatives said that Mamie was a well behaved ladylike young woman who obeyed her family. Aleck's story is quite different. Alexander Goldenson was the son of Marcus and Rebecca Goldenson. He lived with his parents, brother Abraham and sister Rachel. The Goldenson family were Russian Jews having immigrated to the United States from Mariampol, province of Sonvalki, Russian Poland. In 1884 the Goldenson family had moved from 444 Ninth Street to Silver Street in San Francisco, then to 24 1/2 Hayes Street next to Mamie Kelly's family. Goldenson had exhibited some artistic talent and had been a student at the Art School in San Francisco, but had been expelled for being "troublesome, manifesting a profound esteem of his own genius and scorning and refusing to heed the directions of his instructors in the details of art." He had been in prison several times before on various charges of misdemeanor drunkenness and violating the Eight o'clock order. June 23 of 1885 he was convicted of battery upon the person of Westley P. Bean and was fined. The relationship of the two to each other is far more complicated. Mamie may indeed have had a school girl crush on Goldenson in the beginning, but that relationship was squelched by both her mother and her grandmother in direct contact with Goldenson's mother. Mamie had spoken to her family about threats that Goldenson had made to her and her family did not care for him or his conduct. They watched him carefully. He maintained that Mamie was infatuated with him, was intimate with him, wrote him notes, followed him and was jealous of his relationships with women. On the day of her murder Goldenson said he received a letter from Mamie and wrote her a note; that he was thinking about her as he and his friend Jack Gordon went to the grocery store on Polk to drink beer. He said there had been a terrible argument between them and that she had called him a "Jew" several times. That he had shot her to shut her up and that she had died with his note in her hand. None of the witnesses to the murder saw or heard any of the things Goldenson claimed and I could find no mention of a letter being found on her body. Goldenson produced a note purportedly written by Mamie saying she loved him and would follow him until she died. Mamie's teacher, Mrs. Armstrong, compared the writing to that of her school work and testified that it did not appear to be her handwriting. Mamie's desk at school was searched and all her books inspected. No mention of Goldenson was found. Mamie's girlfriends testified that she had never spoken of Goldenson and Eve Kelly testified that she had never seen him before the day of the murder. Was the relationship a figment of Goldenson's imagination? The city of San Francisco was incensed over the perception, among all classes of people, that too many cases similar to Mamie's had failed to bring the perpetrator to justice. The Jewish residents of San Francisco felt very strongly about the crime. Not only because of the nature of the murder, but because "Goldenson is, it is claimed, the first of the Hebrew race who has in this country committed the crime of murder." The most prominent Jewish citizens condemned the murder and assured all that if it was necessary they would raise $100,000 to prosecute the case, and not one dollar for the defense. The editor of one of the local newspapers started a prosecution fund and the newspaper donated $50. Sentiment was running quite high against Goldenson. The morning of the 12th advertisements were taken out in the local newspapers calling for a meeting to be held at the Metropolitan Hall on Fifth Street. A huge audience assembled at the Hall to express their indignation to the act of murder committed against Mamie Kelly by Alex Goldenson. Fiery speeches were made and the crowd called for the organization of a Vigilance Committee. Some members of the crowd carried ropes and cried out to "Hang him." The crowd became very excited and it was decided that they would proceed to the County Jail where they would take matters into their own hands. As the crowd passed through the streets its numbers swelled until it was 10,000 strong by the time it reached the county jail. The Sheriff and the Chief of Police had seen the advertisements as well, and had prepared for any emergency that might arise. The County Jail was filled with Deputy Sheriffs armed with repeating rifles; one man was stationed on the roof with a Winchester rifle. Seventy-five police officers in double ranks lined the front of the jail with clubs drawn. Several unsuccessful attempts were made to storm the jail. The crowd was mostly all growl and no grit. A few hoodlums who had joined for the sake of just causing trouble kept the crowd going, but in the end very few arrests were made and the crowd dispersed. Six men were charged with riot. The next day would be Mamie Kelly's funeral and the citizenry of San Francisco would continue to act out their frustrations. Source citations will be provided at the end of Part III. fM - very interesting story. Will be waiting for the rest! Let's hope I don't disappoint. It only gets more bizarre! No fair,leaving us hanging like this! Can't wait for the rest of the story. I have a shooting and a hanging in my ancestory, but each did it to themselves... not so exciting. I learned this from Lidian. It's what's called a cliff hanger! I don't know, I think it's all in how your tell it! Wow! I can't wait to read the rest. And I hope we hear how you came to possess this photo - how fascinating. Reminds me of the old time newspaper serial stories...can't wait for the next edition! Oh my stars, this is absolutely fascinating! I am so excited, can't wait to read the rest. Am Stumbling Shades and Mixxing this post. You are brilliant, fM! You have us on the edges of our chairs! My, what a great detective piece! Thanks Cheri, you know I love a mystery! Are you off the mountain, Mountain Girl? Installment on its way. This was a truly unique bit of research. An old fashioned-serial leaving us all wanting to read the next installment. Most interesting. Just found your most interesting tale of murder and mayhem! Love it. Also, can't wait to read the "rest of the story." Your detective skills are extraordinary.